They’re at the checkout counter at the grocery store, in the library, and beside the candy at the gas station – magazines are everywhere and on average, an American household will spend $100 a year buying them to read, whether on impulse or regularly. Your group can cash in on this tendency and host a magazine fundraiser. Potential customers will like that the popular magazines that they buy in stores will be sold to benefit your group, and you’ll like the funds that come in when people buy subscriptions from you! Your group starts by finding a magazine fundraising company and receiving brochures that will list the magazines available for sale. Depending on the company, you may have choices of up to 800, but others will only have limited choices of around twenty publications. 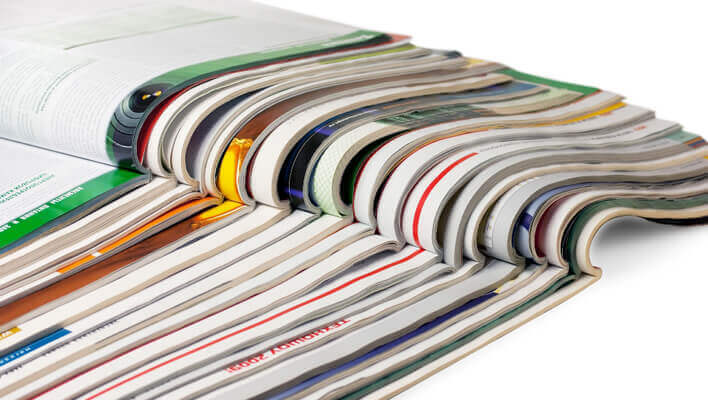 Although the companies that sell more choices may be more desirable to your customers, often the subscription price is higher or you’ll have to pay a higher price for brochures. Some other companies will give you the brochures for free. Choose a company that best suits your group’s budget. Make sure that you also check to see if shipping is included or if it’s free with a minimum order. This is important if your group doesn’t have a lot of financial room. Once you have the brochures and order forms, your participants will go out around the community and show the choices to potential customers. You will receive the payment upfront, as soon as they make their choices. If your customers already have subscriptions, they can renew them with your sales people at this time. At the end of the sales period, you’ll collect all the order forms and money and then place a large order with the magazine company. Delivery takes approximately six to eight weeks. Some companies offer an online ordering option, which eliminates the need for door-to-door sales, and makes it easier for people to support you, because the company’s website will reimburse your group every time someone buys something. As well, gift subscriptions are available with most companies, making it easier to order a subscription for someone else. A good time to host this fundraiser might be around holidays, since a lot of people consider magazine subscriptions great gifts for their friends and family. Additionally, sending out emails to family and friends may encourage them to spread the word to other people that they know, eliciting you more sales. Of course, the more you sell, the higher your profit will be, so it’s important to advertise well. This type of fundraiser has the potential to make a profit margin of 30% to 60%, depending on how much you sell. As well, you should be able to keep your profit upfront. The good thing about this fundraiser is that it’s not limited to a local area, such as a discount card fundraiser, so people in other communities can take advantage of the subscription sale. Sometimes, depending on the magazine, companies will also offer subscription choices like six months for a certain price and a year for a lower price. This may appeal to people who don’t want to spend a lot of money on magazines. Make sure to factor in other costs like shipping, because these can have an impact on your profit. See if you must place a minimum order to get shipping for free or for a discounted price. Magazine fundraisers definitely have their advantages and disadvantages. The pros do outweigh the cons, however. Magazine fundraisers can be hosted at any time of the year, and because most people read magazines, you should get a lot of interest in your fundraiser. As well, it’s not limited to a local scope, so if you want to, you can sell magazines right across the country and renew existing subscriptions, as well. Companies make it easy to order online in a lot of cases, so that also eliminates the need for cold calling. There are cons, however. These include the fact that you may have to compete with similar fundraisers in your area, because this is a popular choice for fundraising. As well, you may need to pay for sales brochures, and people may not like the fact that they have to wait for a long time before their subscription will start. Either way, magazine subscriptions are a great way to break away from the candy fundraisers that seem to be so ubiquitous these days. They spark a lot of interest among avid readers and make great gifts. The best part is, you don’t need a lot of volunteers to sort and pack the orders – the magazines are delivered independently of your group to their subscribers, eliminating the need for quick delivery.